There are a lot of specific things about “Casablanca” that is worth spending time on. So many perfect ingredients made the film the motion picture classic that it is today. When speaking of the film to those who haven’t seen it I always start by talking about the characters. Few movies can boast of a richer and more entertaining cast of characters. “Casablanca” has given us truly memorable people who brim with personality and life. In light of that, consider this a new viewers guide to this brilliant assortment of characters that help make “Casablanca” so superb. When talking about the characters of “Casablanca” you obviously must start with Rick Blaine. Rick has settled in Casablanca where he runs a fiery club called Rick’s Café Américain. Rick is a seemingly cold and distant proprietor who only looks out for himself. He is an American expatriate who we learn is no longer allowed back in the United States. He has a sketchy past and some of his current club dealings are a bit shady. But we get glimpses that he isn’t the self-centered and uncaring soul he pretends to be. Rick is the centerpiece of the film and it is his relationships with every other character that shapes and forms the entire story. Ilsa was a beautiful Norwegian who managed to completely change Rick’s life not once, but twice. We first meet her when she arrives at Rick’s Café Américain with her husband Victor Lazlo. Her meeting with Rick lets us know that there is more history between the two than we may think. Ilsa had a difficult and challenging life especially after the onset of World War II. She lived for a while thinking her husband had been killed in a concentration camp. Her life was complicated even more when she first met Rick and fell in love only to find later that her husband was still alive. It’s that history that makes her second meeting with Rick a bit contentious. Victor Lazlo is a well know anti-Nazi underground hero. His reputation grew after he escaped from a concentration camp and later eluded the grasp of Hitler’s Third Reich. But this Czech Resistance leader enters “neutral” Casablanca as a fugitive along with his wife Ilsa. With the Nazi’s breathing down his neck, Lazlo arranges a meeting in Casablanca where he hopes to acquire exit visas for he and his wife. Lazlo is a bold and courageous man who will sacrifice all to stop the ruthless Nazi aggression. He’s also a man who loves Ilsa deeply which adds an interesting flavor to their visit to Rick’s place. He’s perhaps the most complex character in the entire film. Captain Renault is the head of the Vichy controlled police in Casablanca. He is unashamedly corrupt and never pretends to be otherwise. Whether he is accepting gambling bribes from Rick or signing exit visas for favors from the prettiest of applicants, Renault rarely shows any sign of a conscience. But he is also in a tight spot. Lazlo’s arrival in Casablanca also brings a stronger Nazi presence and Renault’s hint of control hinges on the Nazis allowing it. Considering his lack of scruples, the question is how far will he go to protect his control and his own hide. Leading the search for Victor Lazlo is Major Strasser. The arrogant and overconfident Third Reich leader is determined to make sure Lazlo doesn’t leave Casablanca. Renault may appear to be the man in charge, but on numerous occasions Strasser proves that it is he and the Nazi regime that pulls the strings. Strasser is deceptive in that he always maintains a coolness about him. But simply listening to his words lets us know that he believes in Nazi supremacy and he will make sure it ultimately comes to pass. Ugarte is a small-time crook who has recently “acquired” letters of transit. How did he get them? He killed two German couriers. The Nazi’s are hot on his trail so he comes to Rick’s place in hopes of stashing them. Ugarte’s reputation precedes him and even Rick keeps his distance. But Ugarte soon realizes he is in way over his head and Rick may not be the best person to look to for help. Rick’s place wouldn’t be the same without piano player Sam. Rick’s relationship with Sam is more than professional. In fact it could be said that Sam in Rick’s one true friend and Sam clearly knows Rick better than anyone else on earth. Sam was in Paris when Rick and Ilsa first met. He knows the scars Rick has as a result of it and he knows the trouble that could come from her return. Sam is always loyal to his friend and even though other opportunities have come (for example a generous offer from Ferrari to work at a rival club), Sam will never leave Rick’s side. Ferrari is the owner of a rival club called The Blue Parrot. Ferrari has an undeniable corrupt side to him, but he still maintains a friendly relationship with Rick. He is always looking for a way to make more money whether it’s buying Rick’s club, hiring away Sam or by more dubious means such a smuggling people from hear to there. Ferrari always seems to pop up whenever there is potential profit to be made, but he could also be a good person to have on your side in times of need. Carl is another great piece that makes Rick’s Café Américain such a great place to visit. Carl is a friendly and passionate fellow whose loyalty to Rick is shown numerous times. We learn that Rick trusts Carl implicitly and he cares for him to the point of making sure he is taken care of even when he club looks to be in jeopardy. Manning the bar is the lovable Sascha. He is another of Rick’s loyal employees whose strong relationship with his boss proves itself numerous times. Sascha also doesn’t mind sharing his affection for one certain French woman named Yvonne. He is a fun-loving bartender but he also is dependable when things take more serious turns. What’s a movie without great characters, right? Well “Casablanca” has some of the best and this is an introduction to ten of them. But there are even more scattered throughout this wonderful movie. Hopefully you’ll take time to meet them all. I promise that it is well worth it. How is it that I have been movie blogging in some fashion for over three years yet I’ve never reviewed my favorite movie of all time? Well it’s time to remedy that. That opening line probably spoils any mystery about my final score, but that’s perfectly okay. To me “Casablanca” is a perfect film and I owe a lot to it for broadening my appreciation for classic cinema and for introducing me to my favorite actor of all time – Humphrey Bogart. The world of cinema has long regarded “Casablanca” as a true classic. Often times I rebel against that kind of establishment recognition but in some cases they get it right. This is one of those instances. “Casablanca” is a classic in every sense of the word. 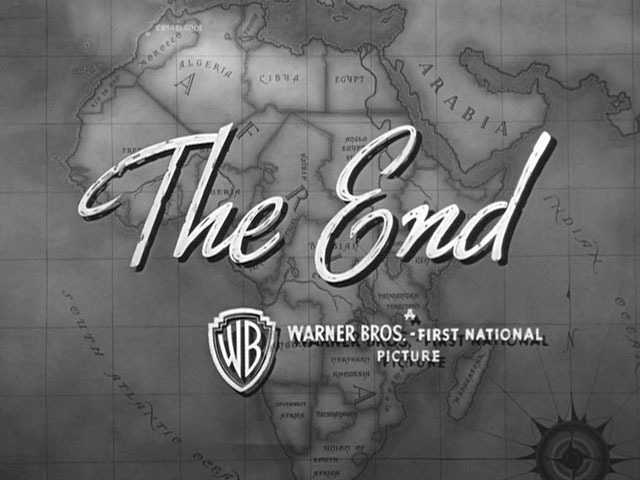 Whether your talking about the flawless direction from Hungarian born Michael Curtiz, the brilliant screenplay brought together by a number of people including brothers Julius and Philip Epstein, Casey Robinson, and Howard Koch, or the spectacular cast led by the cool confident Bogart and the stunningly beautiful Ingrid Bergman. “Casablanca” not only has all of the ingredients for a true classic, but it doesn’t waste any of them. Warner Brothers didn’t have very high expectations for the film. In fact it was rushed through to its release in order to capitalize on the North African campaign of World War 2. The initial response was lukewarm but the film would quickly prove itself and ended up winning three Oscars including Best Picture. Over the years the appreciation for the film has only grown and with good reason. It truly is something special. Romance, patriotism, humor, suspense – “Casablanca” has it all. Bogart leads the way as the complex Rick Blaine. He owns and runs Rick’s Café Américain, a popular nightclub in 1941 Vichy controlled Casablanca. He keeps his business flourishing during a tumultuous wartime by being neutral and “sticking his neck out for nobody”. He’s surrounded by a great assortment of supporting characters, many played by some of Hollywood’s best at the time. Claude Rains received an Oscar nomination for his turn as a corrupt Vichy Captain with a special interest in Rick. The great Sydney Greenstreet plays a rival club owner. Consummate character actor Peter Lorre plays a crook who is in way over his head. And there’s Dooley Wilson as Rick’s loyal friend and club piano player Sam. Fun fact – Dooley was a drummer and didn’t know how to play the piano at all. Yet his character’s singing and playing of “As Time Goes By” is unforgettable. But Rick’s well controlled life takes a dramatic turn when the former love of his life Ilsa (Bergman) shows up at his club. Ilsa’s husband Victor Laszlo (Paul Henreid), a well known Czech resistance leader and fugitive from the Nazis, is with her. They seek Rick’s help to get out of the country before the Nazi Major Strasser (Conrad Veidt) catches up to them. Rick is reluctant due to the bitterness of having his heart broken and his desire to maintain his establishment’s neutrality. Does he risk it all for the woman he once loved? “Casablanca” captures and utilizes so many things well. There’s a high level of suspense. There’s a small touch of humor. There is a great realization of wartime tensions. And right in the middle of it all is what may be the best romance in cinema history. Bogie and Bergman have a sizzling chemistry and the looming threats and high stakes all around them adds such a pop to their relationship. Bogie is a hurt man hiding behind a convincing facade of tough coolness. Bergman is brave but torn and she was never more beautiful than in “Casablanca”. It’s impossible not to be completely absorbed in these two and the intense circumstances surrounding them. There isn’t a bad performance in “Casablanca”. There isn’t a wasted line or wasted shot. There’s never a down moment. It’s pacing its absolutely perfect. The camera work and stage design is impeccable. The romance simmers. The story is smart and fluid. I could go on and on. As I said, “Casablanca” is rightly called a classic. It accomplishes so much that modern movies with their massive budgets and greater technologies seldom lay hold of. It’s beautiful storytelling with one memorable line after another and a Bogart performance that forever etched his name in film history. It’s my favorite movie and I can never see it enough.